Korm found all those screws, in total I removed 12 screws, and it was loose, but seemed to have "something preventing its release. Jimmy, I'm also doing this from memory as it's a long while since I've dismantled a very early Stainz - but I THINK that you need to drop the gearbox/power unit out from the chassis (it's held in by the two black blocks at either end that support the couplers) - from experience it may take a bit of firm wiggling to get the unit free - and then I think you will find a last "hidden" screw that is actually holding the rear of the boiler/firebox assembly to the footplate..... remove that final screw and it should all come apart! 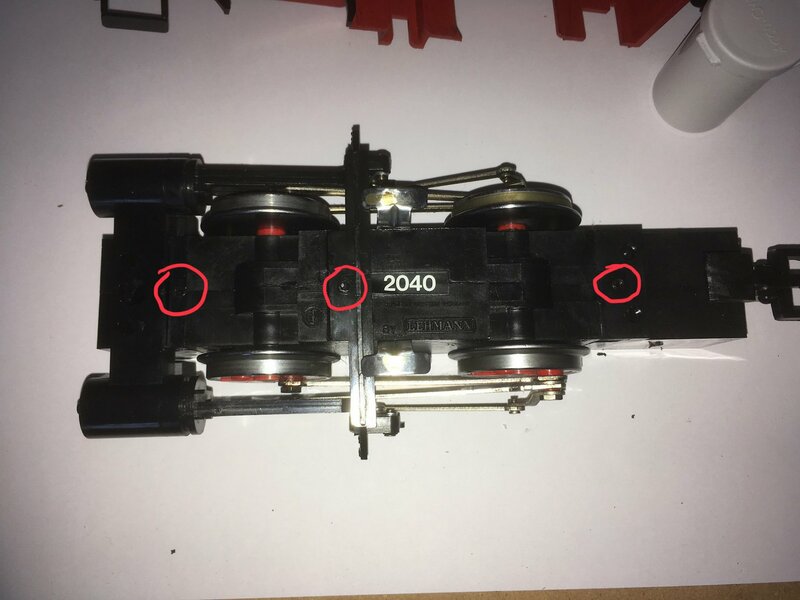 Addendum to above, make sure you've also unscrewed the two black brackets on top of the footplate that connect to the two vertical motion rods, otherwise you won't be able to completely free the power unit from the footplate. Jon, that sort of makes sense, it all back together at the moment, so removed the screws and chimney, and the power unit will drop out (though not literally), which is what I wanted out, to inspect the contacts etc. 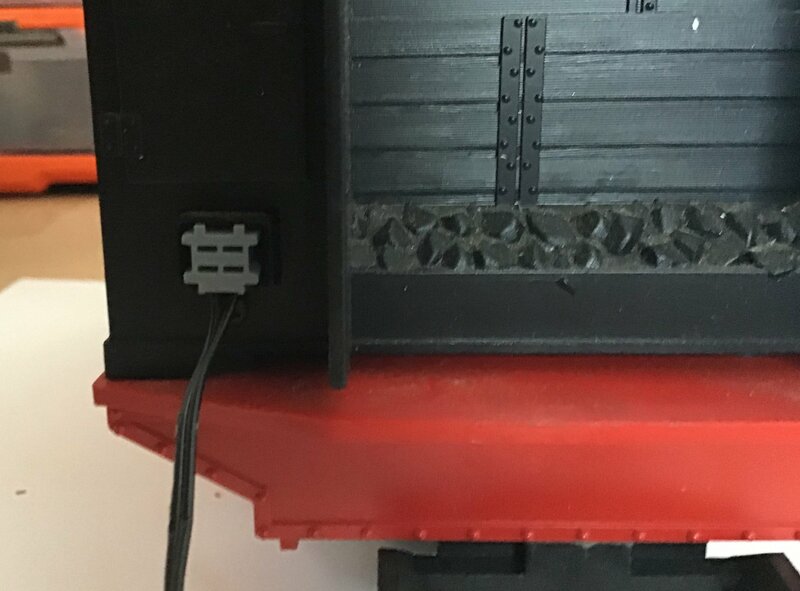 Does yours have the little screws on the motion brackets? Yes hiding underneath, between the motion couplings. Korm's photo shows this very well. 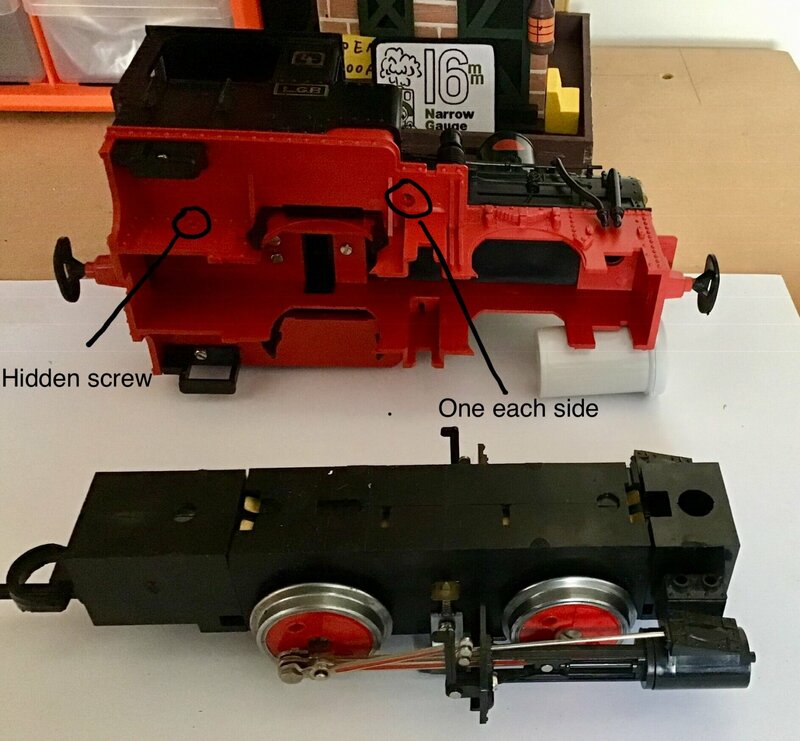 Those two screws definitely need removing, to free the motion links and allow the gearbox to be dropped away - but they won't actually free the cab and boiler from the footplate. Once you've pulled the whole gearbox, wheels, motion and cylinders assembly out, you should find the last secret screw - heaven knows why LGB's early designers decided to do it that way......? I seem to recall that this hidden but vital screw was the biggest hassle when I tried to reassemble an old brown-cab Stainz No.1 after DCC chipping it..... in order to connect the new wiring to the motor block, you really want the gearbox inserted into the frames BEFORE you put the boiler and cab back on, but that is impossible to do.... I think I finally figured out a solution after much cursing, but I can't clearly recall what it was! I seem to remember that some of the early Stainz did not have lens covers fitted from new. my 2040 did and does not have one. about the 2040 - the first starterset was numbered 20400-1.
i suspect, that the set number inspired the number for the loco made for this set. 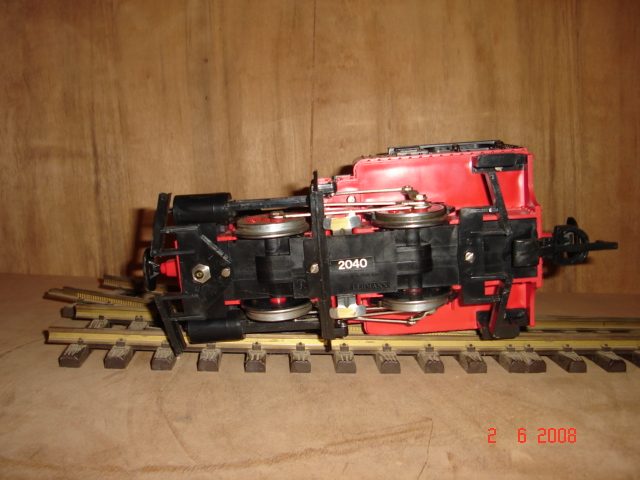 in the early prospects, the 2040/or the black loco number 4 were never advertised for sale as loco. Nice link, however it is the more modern version than Jimmy has so will be quite a bit different. It will be very useful for me as I have 3, two of them in lots of bits to put back together to move on! Gap nice instruction, thanks, however, as Jon says this is the newer model, but I believe the principle remain the same. In some ways yes, but there are some significant differences - though appearing outwardly very much the same, the venerable Stainz has seen quite a few design changes internally over the decades. I've used it to disassemble my 2010 (No 1) and 2020 Stainz (No2) there were from memory some differences but a lot of similarities. 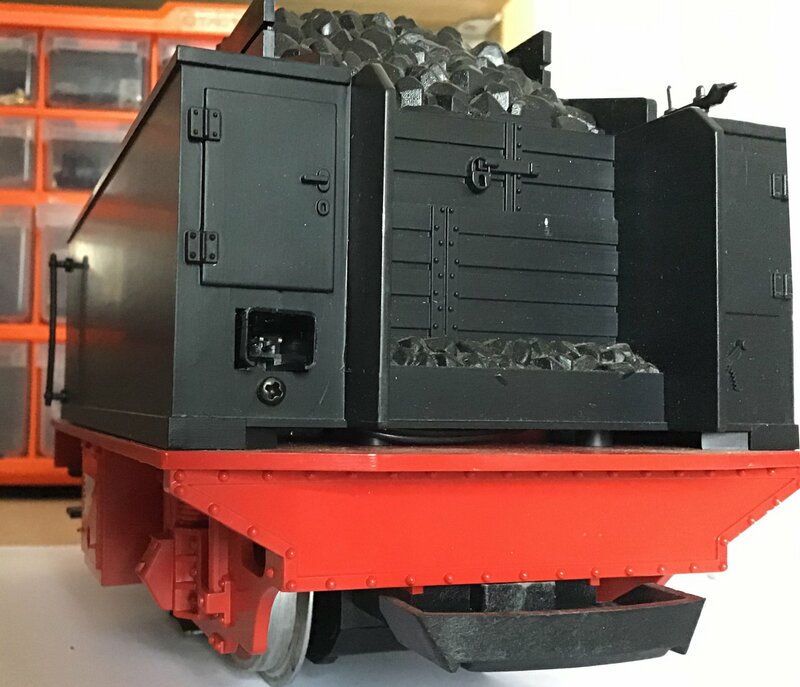 The tricky bits were the little crank looking bits that went between the boiler and the cab. So three screws as above and three screws in the base (don't forget the chimney). 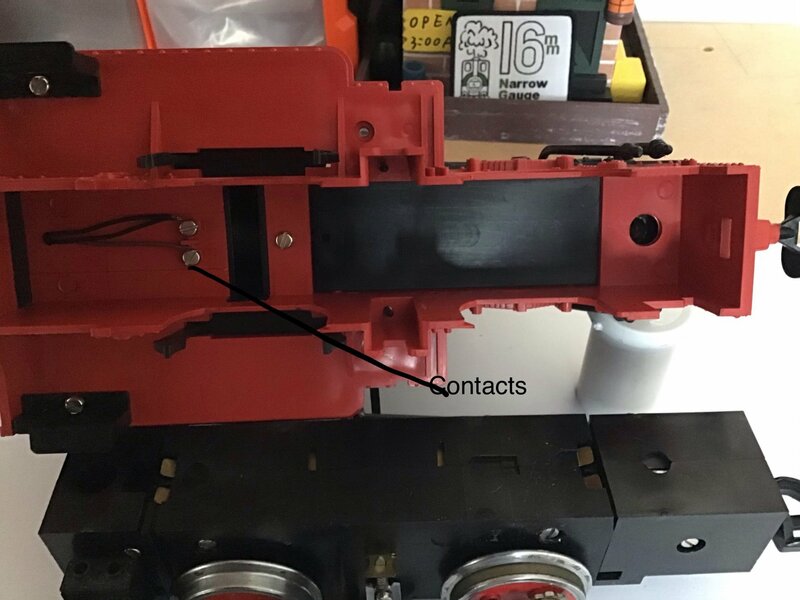 Okay, Glendale do not have lenses, so it would seem Traini is where I will need to go: So moving on I looking for a power socket as per the photo below, additional cable may be handy but the socket shown mounted on the tender is what I what (I think). My rational being that the tender as well powering itself would provide extra feeds to the loco. PhilP, could be a good alternative, will bear in mind. I'd forgotten about that one sideways screw through the frame, Jimmy - the "hidden" screw that I was referring to is the one an inch or so in front of the two "contact" screws in your pic above, that is the one that goes into the underside of the firebox and holds the boiler on to the footplate, which you can't get to until the power unit is out. I ordered enough to make it worth the postage, so I have some spare straight and right angled 2 pin sockets. you'ld probably have to make a little right angled bracket to fit it to the inside of the cab, but if you private message me your address I'll send you a couple gratis. No spare link cables I'm afraid but I may have some spare plugs to make your own with.